The reservoir created by the main dam and the two saddle dams have a capacity of 12.57 billion cubic metres. Image courtesy of ZSM. The dam generates 400MW of power and enables irrigation of about 30,000ha of land. Image courtesy of ZSM. The construction of Ghana's Bui Dam was started in 2007. Image courtesy of ZSM. 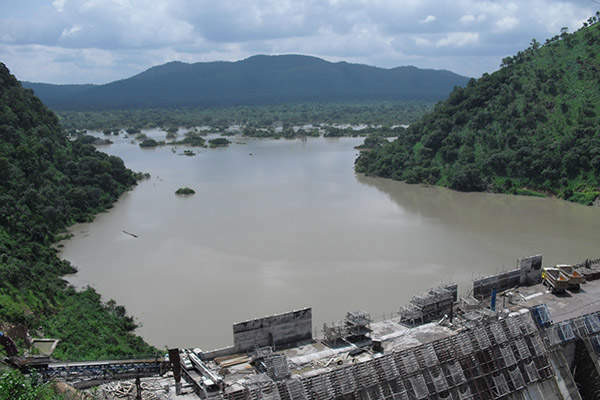 Bui Dam is a gravity roller-compacted concrete dam located at the Bui National Park in Ghana. The dam generates 400MW of power and facilitates irrigation of about 30,000ha of land. Construction was initially estimated at $622m, but a cost review conducted in 2012 raised that amount by $168m. Built by the Sinohydro Corporation as part of an Engineering, Procurement, and Construction (EPC) Turnkey Project Contract, the project is owned and managed by Bui Power Authority (BPA). The first phase of the project included detailed field investigations and preparatory work, while the second phase comprised construction of the main dam, a spillway, a power house, and transmission lines. "The two loans were offered by China Ex-Im Bank, with a grace period of five years and an amortisation period of 20 years." Ghana‘s Akosombo Dam and the Kpong Dam were constructed to generate power. However, the Bui Dam is intended to both generate power and provide water for irrigation. It has also improved tourism and fishing industries in the region. In addition, the dam provides protections from flooding and it generated several jobs during construction. A total of 1,216 people within the project area were resettled and 444km2 of land was inundated. The project faced revolts from environmentalists due to the resettlement of fishes and animals such as the hippopotamus. 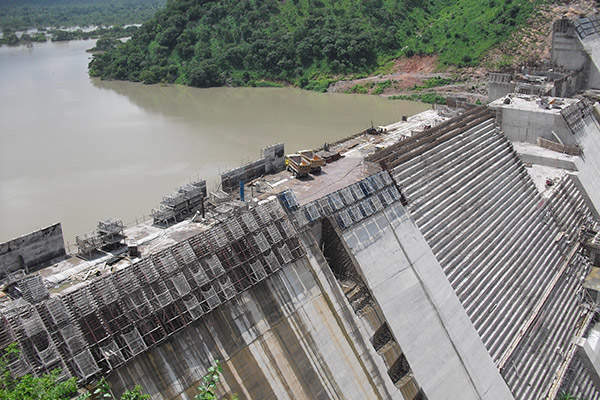 The diversion of the Black Volta River was completed in December 2008 and the construction of the main dam began in December 2009. 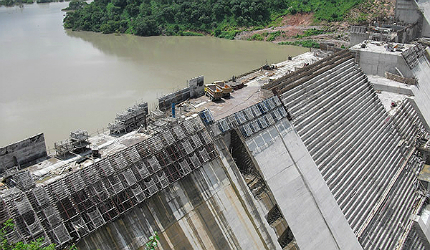 The dam was commissioned for operations in December 2013. The Bui Dam has a height of 108m above the foundation and 90m above the riverbed. The crest of the dam is 492m long and 185m high. The overall structural volume is one million cubic metres. "The Bui Dam, on the other hand, is a multipurpose dam which, besides generating power, provides water for irrigation." 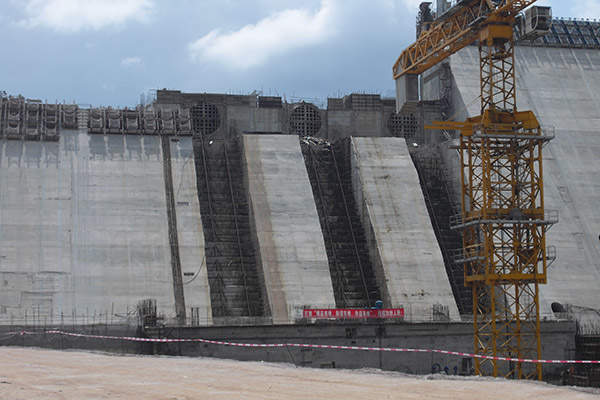 The project also included construction of two saddle dams on the south-western part of the main dam. These have a crest elevation of 187m. One of the saddle dams is a rock-fill embankment dam, while the other is an earth-fill dam. Created by the main dam and the two saddle dams, a reservoir was formed with a gross capacity of 12.57 billion cubic metres. 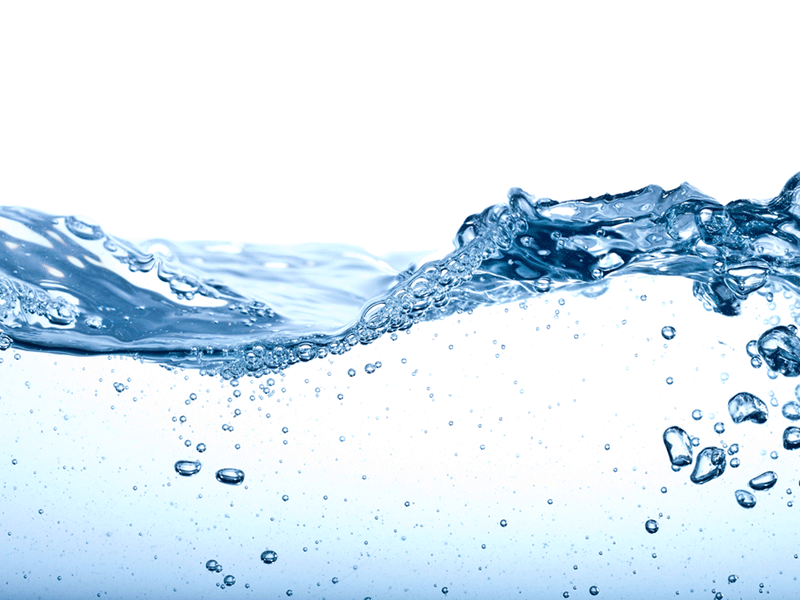 Around 61% of this water is utilised for power generation and irrigation. The Bui Reservoir covers a total area of 444km² at a maximum elevation of 183m and an average length of 40km. The spillway comprises five gates to regulate the flow of water, which measure 15m each in width. The spillway comprises a single outlet and is located on the right bank with an elevation of 169m. The capacity of the spillway is 10,450m³ a second. The project also involved construction of a bridge across the Black Volta River downstream of Bui Dam. The bridge connects Brong Ahofo and the Northern Regions. The project was financed through a concessional loan of $270m, a commercial loan of $292m, and $60m in funding from the Government of Ghana. The two loans were offered by China Ex-Im Bank, with a grace period of five years and an amortisation period of 20 years. The idea to construct the Bui Dam was first conceived by the British-Australian geologist Albert Ernest Kitson in 1925. Planning began in 1960 with support from the World Bank and Australia. However, these plans did not materialise. The first promising activity was undertaken in 1992 when Coyne et Bellier (now Tractebel Engineering) carried out a feasibility study. Ecological investigations were also carried out in 1997 by the University of Aberdeen. The Volta River Authority authorised Halliburton and Brown and Root in 1999 to construct the dam, but it was held back in 2001 by the Government of Ghana. The project finally became a reality when Sinohydro submitted a bid with funding from the Chinese Ex-Im Bank in 2005. It was followed by an environmental impact assessment and a feasibility study. The creation of the Bui Power Authority in August 2007 gave further impetus to the project. Field Investigations for the project began in October 2007, with preparatory works commencing in January 2008. The Government of Ghana through the Ghana Water Company is currently implementing a programme of economic and structural reform with the support of the IMF and the World Bank. Construction of the new Naga Hammadi barrage was completed in the spring of 2008. The 330m long dam at Naga Hammadi in Upper Egypt replaces a structure built in the early 1900s. Aswan High Dam is a rock-fill dam located at the northern border between Egypt and Sudan.